Every political science class I took with Professor Bernie Firestone! He was by far the best and most engaging teacher I had at Hofstra. My fondest memories at Hofstra were anchoring the news for the Communications Department news broadcast and on the radio station WRHU. I worked part time at CBS News in New York while attending Hofstra. I was able to take what I learned at CBS and put it to use on the Hofstra broadcasts. What was your first job after graduating from Hofstra, and what was the most valuable thing you learned there? I continued to work at CBS News as a desk assistant until I got a job at as an editor/producer/reporter at WPOP Radio in Hartford, CT. I worked there for two years before my television career took off. Investigative reporting. I learned quickly that there’s a lot more to reporting than showing up at the story. As an investigative reporter, I’ve been able to have a positive effect on my community by exposing stories such as defense contractors using defective parts in equipment used by our troops, political corruption, and cheating in academics and sports. What advice would you give current Hofstra students? Find your passion and don’t let anyone tell you it can’t be done. Success comes easy to some people. For most of us, however, success requires out-working the lucky ones. How has your Hofstra degree helped you in your current position? Hofstra provided me with the foundation to pursue a career in journalism. My degree has also been a source of great pride. It’s given me a “leg up” because so many people I’ve encountered are aware of the great reputation of the University and its graduates. What has been your favorite report to cover? That’s a tough question. I won the Peabody Award after uncovering that Sikorsky Aircraft was putting defective parts in its Black Hawk helicopters. There have been so many great stories – from the district attorney in bed with the mob, to getting back benefits for a lost and forgotten Vietnam vet, to exposing a corrupt politician. Then there are all the times I’ve been an eyewitness to history… covering presidential elections and interviewing presidents and senators. No story is the same. Who in your field do you most admire or aspire to be like? I’ve been so fortunate to work with great reporters such as Walter Cronkite, Dan Rather, and Charles Osgood. I will always consider Charles Osgood my mentor. He taught me how to write news. He is a giant in our industry, but took time to teach a kid who wanted to follow in his footsteps. He was always there, willing to help me along the way. Alan Cohn (B.A. ’85) is a reporter for the I-Team at ABC Action News in Tampa, Florida. A longtime believer that "there's a lot more to reporting than showing up at the story," Alan received the 2007 George Foster Peabody Award, one of journalism's highest honors, for uncovering that defective parts were being installed on Black Hawk helicopters built by Stratford-based Sikorsky Aircraft. 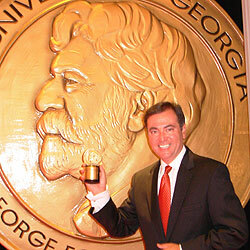 He also was honored with the regional Edward R. Murrow Award for Outstanding Investigative Reporting. While at WTNH in Connecticut, Alan uncovered that employees of the Department of Motor Vehicles were illegally selling drivers licenses to illegal aliens, setting off a statewide scandal that led to arrests and changes in the way Connecticut motorists obtain driver’s licenses. Alan also uncovered major gaps in security onboard Metro North, the largest commuter rail system in the United States. Alan previously worked at the NBC News Channel Network where he was a freelance correspondent covering stories and live shots for NBC owned and operated stations and NBC affiliates across the nation. He was also an investigative and Emmy Award-winning reporter and fill-in anchor at USA Broadcasting's flagship television station (WAMI). His reports helped win back benefits for a Vietnam veteran, expose fraudulent police charity, and expose allegations of physical abuse at a drug treatment center. Alan has also worked for New England Cable News, where he received an Emmy Award for uncovering the story of a convicted killer attempting to become a Boston police officer. He began his career as an assistant producer at CBS News in New York, and later worked at WTIC-TV in Hartford and WBBG-TV in Springfield, MA. He and his wife, Patricia, have two children, Ann and Aaron.